Real-time team projections after every pick across dozens of categories. During the draft, it's important to have a well rounded team across all of your positions. 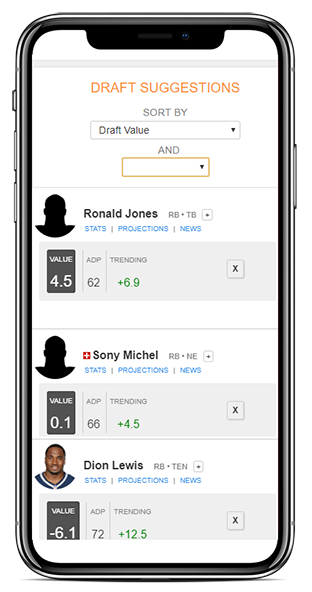 The Draft Genius provides a real-time team projection after each and every pick so you can adjust your strategy as the draft unfolds to help create a balanced team. Perfect for both category based leagues and H2H Points. Our draft suggestions are powered by our custom ADPs based on real leagues by FantasySP members. Plus we provide trending ADP data to see how each player has changed throughout draft season. Narrow down Pick Suggestions based on a position and/or specific category like rushing attempts. Cut down on research time. Grab the latest news from hundreds of news sources about ANY player. Need help after the draft? The Fantasy Assistant has you covered.